This weeks show is an open discussion with different business sectors. We’ll discuss professional photography, the future of town centres, and what apart from golf does a golf club offer. 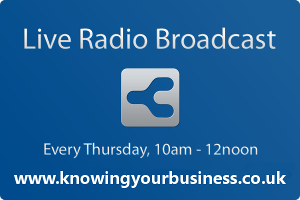 The Knowing Your Business Show talk with Samantha Vaughan, Iain Nicholson, and Greg Heath. Samantha Vaughan tell us what it’s like to take the plunge from secure employment to starting a photographic business. Samantha and Steve of SSV Photography is a husband and wife team that offers wedding, event and reportage photography in the Oxfordshire, Buckinghamshire, Northamptonshire and Warwickshire areas. Iain Nicholson explains the future of the High Street and it’s success stories. Iain is a PR & Communications for business specialist based in Oxfordshire. He draws on expertise in public relations, business communications strategy, using social media, and skills training. He has strong connections to key press, radio, business journal and online media outlets. Iain is a former BBC radio journalist and co-founder of countywide business network OTCN. Greg Heath tell us what’s it’s like to run a golf course alongside what they have to offer for non golfers. Ian Gentles Digital Marketing Manager of Knowing Your Business. .